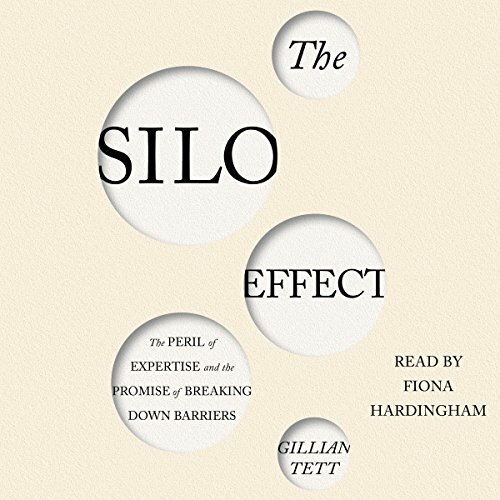 From award-winning columnist and journalist Gillian Tett comes a brilliant examination of how our tendency to create functional departments - silos - hinders our work - and how some people and organizations can break those silos down to unleash innovation. One of the characteristics of industrial age enterprises is that they are organized around functional departments. This organizational structure results in both limited information and restricted thinking. The Silo Effect asks these basic questions: why do humans working in modern institutions collectively act in ways that sometimes seem stupid? Why do normally clever people fail to see risks and opportunities that later seem blindingly obvious? Why, as psychologist Daniel Kahneman put it, are we sometimes so "blind to our own blindness"? Gillian Tett, journalist and senior editor for the Financial Times, answers these questions by plumbing her background as an anthropologist and her experience reporting on the financial crisis in 2008. In The Silo Effect, she shares eight different tales of the silo syndrome, spanning Bloomberg's City Hall in New York, the Bank of England in London, Cleveland Clinic hospital in Ohio, UBS bank in Switzerland, Facebook in San Francisco, Sony in Tokyo, the BlueMountain hedge fund, and the Chicago police. Some of these narratives illustrate how foolishly people can behave when they are mastered by silos. Others, however, show how institutions and individuals can master their silos instead. These are stories of failure and success. ©2015 Middlesex Sound and Vision. All rights reserved. (P)2015 Simon & Schuster, Inc. All rights reserved. What disappointed you about The Silo Effect? After an interesting introduction, what followed was a history of modern anthropology that just ran too long to make its point. The case study about Sony was promising. Then it just went flat. I couldn't stay interested. The theme suggested by the title was never convincingly developed. I hoped for a useful insight to apply at work, where we have probably the normal number of silo issues. Has The Silo Effect turned you off from other books in this genre? The reader misread words and emphasized the wrong word or syllable so often it became a major distraction. In the passage about Chicago, she read about Cook Country several times before correcting it to Cook County. In parts about technology that involved VMWare she emphasized "Ware" like it was a person's last name, then later read it as WMWare. If you could play editor, what scene or scenes would you have cut from The Silo Effect? I would just make sure that words are pronounced correctly and consistently. In obvious cases of mispronunciation that are later corrected, like Country/County, why didn't they go back and re-read the passages involved? This is an essential aspect of listening to a book rather than reading the printed version. It came across as cheaply produced. Would have enjoyed it more if the narrator gave more of a sense that she understood what she was reading. She has a lovely voice and pleasant British accent but the overall experience was not too different from listening to a computer speak. This book is actively changing my response to life because it explains in functional terms why corporations succeed or become bogged down. Not stated in the book is that the principles presented also apply to society in general, explains why governments and social systems succeed or fail. What did you love best about The Silo Effect? First section (introduction to Silos and links to Anthropology) were actually interesting and a perspective I hadn't had before. I could listen to her read a phone book. Seriously I thought it was good. A couple of the IT words were mispronounced, but no big deal. Starts strong but gets a little bogged down with final couple of chapters. Felt like filler. The book and its premise were fascinating. A must read for anyone who works in a corporate setting and desires to do things more efficiently while improving the work life balance. The problem was the narrator. She clearly did not have a grasp of the material and narrated accordingly. She mangled words and names which could have been remedied by even the most rudimentary research (eg EBITDA, etc). Her staccato narration style was irritating at best and made what should have been an interesting book a nightmare to listen to. My suggestion: have the author of the book narrate it. I have seen Gillian Tett on numerous shows and interviews, and she has a pleasant and convincing voice.